Website and processes: 18 Jan 16 Sam, 5/5 Excellent "The only thing that would have improved the transaction would have been the option to choose how many of this particular type of ticket I would like to buy so that I didn't have to complete the transaction twice. Apart from that minor detail it was all very easy!" This fabulous flight is flown from Oban Airport set in a stunning location just 5 miles from Oban Town. 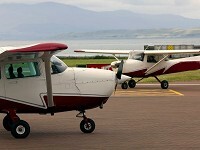 This fabulous experience starts when you arrive at our lounge where tea coffee and biscuits are provided, after an informative briefing about your flight you will then depart south west in our Cessna aircraft towards Oban Town with views out to the west of Lismore Lighthouse and the island of Mull, flying over McGaigs Tower and Oban Town and then flying south over The Bridge Over The Atlantic with Stunning views of The Paps Of Jura, Easdale Island and Ben Cruchan. Please bring a film or video camera to record this wonderful and unforgettable experience.